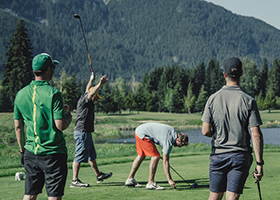 In order to create the ultimate golf experience, one has to hire the right people. We see golf as an exciting career for all types of professions. Golf, more than any other sport, is experience driven. The more positive impressions we are able to create for our Guests, the greater the opportunity for us to stand out as industry leaders. Submit your current resume and references, to the specific property (application details included on Job Postings). Or, download the Application for Employment form (pdf). If a property has no positions open at this time, you are still welcome to submit your application, which we will keep on file for 3 months. Are you interested in a career in tourism/recreation? Visit go2hr.ca to answer any questions you may have and to help get you started. GolfBC was selected as "runner-up" for the 2008 'Employees First' Award! The 'Employees First' award is presented each year to a BC tourism employer to recognize exceptional standards of excellence in human resources and people management.